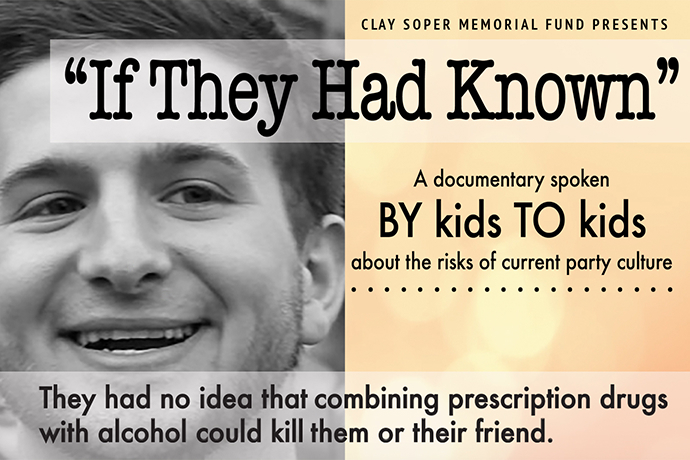 BANGOR, MAINE - Husson University’s Student Health Services will be sponsoring a free screening of “If They Had Known,” a documentary film featuring interviews with teenagers talking about the tragic consequences that result when young people mix alcohol and prescription drugs. The film will be shown at Husson University’s Gracie Theatre on April 11 at 7 p.m. The Gracie Theatre is located at 1 College Circle in Bangor. A trailer about the film can be found at https://www.facebook.com/watch/?v=560397864361722. Vijay Amarendran, MD, MS, Director of Addiction Services, Penobscot Community Health Center (PCHC). Amarendran is board certified in psychiatry and addiction medicine and a Fellow of the American Psychiatric Association. He also has an active Suboxone practice at the PCHC - Brewer Medical Center. He completed his medical degree in Chennai, India in 1997 and his master’s degree in molecular biology at the University of Wyoming in 2003. He did his residency training in psychiatry at SUNY Buffalo and worked at The Acadia Hospital from 2007- 2018. He works part-time at PCHC and part-time at his private practice in Bangor, Maine. Raymond Bessette, Executive Director of Safety and Security, Husson University. Bessette came to Husson University in June of 2015 after having served 30 years in the Maine State Police, where he retired at the rank of Lt. Colonel. Leona Cerkovitz, DNP, APRN, CS, FNP-BC, Assistant Professor, Husson University School of Nursing. Leona Cerkovitz obtained her Doctor of Nursing Practice degree from the University of Southern Maine in 2017 with a focus on preconception counseling in women with substance abuse issues. She is dually certified as a Clinical Specialist in Psychiatric Nursing and as a Family Nurse Practitioner with over twenty-years of clinical experience. In her current role at Husson University, Dr. Cerkovitz instructs graduate students in the psychiatric mental health nurse practitioner program. In addition, she also provides healthcare services to students at the Husson Wellness Center several days a week. Her professional interests include complementary medicine, integrative health models of care, mind/body research and biomedical research. Laurie Eddy, MSN, RN, FNP-BC, WHCNP, Assistant Professor, Husson University. Eddy has been at Husson since 2003 as an adjunct and a full-time faculty member since 2006. She also provides healthcare services to students at the Husson Wellness Center. Eddy graduated from the Eastern Maine Medical Center School of Nursing with a nursing diploma. She received her Bachelor of Science degree at St. Joseph College and then spent the following five years in Alaska in obstetrics/labor and delivery. When she returned to the “Lower 48” she returned to school for her Women’s Health Nurse Practitioner certificate. Eddy worked as the director of Penquis Family Planning for 23 years. During that time, she received her Master of Science in nursing (MSN) and her family nurse practitioner (FNP) degrees from the University of Maine. She’s very interested in women’s and global health. Since coming to Husson, Eddy initiated an interprofessional student project involving nursing, occupational therapy, physical therapy, and pharmacy students. These students, along with students from the University of Southern Maine (USM), travel to the Dominican Republic each winter to deliver healthcare services to underserved populations. Eddy has conducted research on mothers with substance abuse issues and has presented a poster in a national conference on her research. Phil Hamm, Assistant Fire Chief, Firefighter / Paramedic, Bangor Fire Department. Phil Hamm has been a firefighter/paramedic for the Bangor Fire Department since 1997. While moving through the ranks of lieutenant and captain, he served in various roles that encompassed the field of emergency medical response. Since 2018, Hamm has overseen daily operations as assistant fire chief. The Bangor Fire Department averages 26 fire and emergency medical services (EMS) calls a day. The department also responds to over 7800 EMS calls a year. Jason Moffitt, Brewer Chief of Police, Public Safety Director, Brewer Police Department. Chief Moffitt received a Bachelor of Arts degree in psychology from the University of Maine. He also holds two master’s degrees from Husson University; a Master of Science in business and a Master of Science in criminal justice with a certificate in counterterrorism and security. He is a graduate of the Maine Criminal Justice Academy, where he holds a current executive certification and is a certified instructor. Moffitt has been a law enforcement officer since 1996, beginning his career with the Penobscot County Sheriff’s Office as a rural patrol deputy. In 2000, he joined the Brewer Police Department as a patrol officer, where he served in a variety of roles. His responsibilities included supervising patrol and investigative functions. Currently, he is serving as the public safety director for the City of Brewer where he is responsible for the leadership and management of the police and fire departments. Chief Moffitt is an active member of the Maine Chiefs of Police Association and the International Association of Chiefs of Police. Colleen Owens, LCPC, Husson University, Director of Counseling Services. Owens is a licensed clinical professional counselor (LCPC). She received her master’s in mental health counseling from Gallaudet University in Washington, DC. Owens has worked in a variety of healthcare settings including hospitals, private, and non-profit organizations. She has been the director of counseling services at Husson University for the past three years and has worked as a counselor at the University for six. Brent Scobie, PhD., LCSW, Vice President of Clinician Services and Quality, Northern Light Health Acadia Hospital. Scobie is the vice president for clinician services at Acadia Hospital and a member of the adjunct faculty at the University of Maine. Scobie is also a field reviewer for the Substance Abuse and Mental Health Services Administration’s Treatment Improvement Protocol on Medication Assisted Treatment. As a practicing clinician, he has 20 years of experience providing treatment to adolescents, young adults and their families on issues related to mental health and addiction. Kara Taungatu'a, BSN, RN-BC, CEN, Emergency Department Clinical Educator, Northern Light EMMC Emergency Department. Kara Taungatu’a, BSN, RN-BC, CEN has over 20 years of emergency medicine experience. Besides working for a local ambulance service for over five years, Taungatu’a has worked full-time in the Northern Light Eastern Maine Medical Center’s Emergency Department since 2001. In addition, she has worked per diem on the medical surgical unit at Waldo County General Hospital and Blue Hill Memorial Hospital’s Emergency Department. She currently serves on several hospital and community-based committees and organizations. She has also been involved with forensic evidence collection for victims of sexual assault, child abuse, and domestic violence.